This luscious strawberry pie is low-carb, gluten-free, and probably the easiest pie you will ever make! Place frozen berries in a large saucepan over medium-low heat and cook, stirring frequently, until reduced to 1/2 cup and as thick as jam, about 20 to 25 minutes. Whisk or stir with a fork to break up any large berry pieces. Stir in lemon juice and let cool. In a medium bowl, beat cream cheese and yogurt until smooth. Beat in vanilla, EZ-Sweetz, cooked berry puree, and salt. Fold fresh berries into cream cheese and yogurt mixture. Spread evenly in baked pie shell and refrigerate until set, about 4 hours. Filled pie can be refrigerated for 24 hours. Store filling and crust separately for longer storage. Top with Whipped Cream sweetened with EZ-Sweetz and garnish with a berry. This tasty crust is excellent for any one-crust pie or tart. Preheat oven to 375 degrees F. Butter bottom and sides of a 9-inch pie pan. Mix crust ingredients together and press into pan. Bake for 8 to 9 minutes or until lightly browned and fragrant. Remove from oven and let cool. *EZ-Sweetz liquid sweetener comes in stevia, sucralose, and monk fruit versions. All have zero carbs. 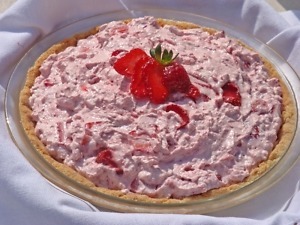 Almond pie crust, Easy Recipe, EZ-Swwetz, Judy Barnes Baker, Strawberry pie. Bookmark. Good job on the videos 🙂 I really like them, and I definitely think you should make some more! Does ez sweetz contain gluten? Thanks, Ancestral Chef! It was a big job, but it was fun too. Glad you liked them. Anonymous: no EZ-Sweetz does not contain gluten. There are several different formulations (stevia, sucralose, monk fruit, etc.) but all are sugar-free and gluten-free.